I hope you all had a wonderful start of the New Year. 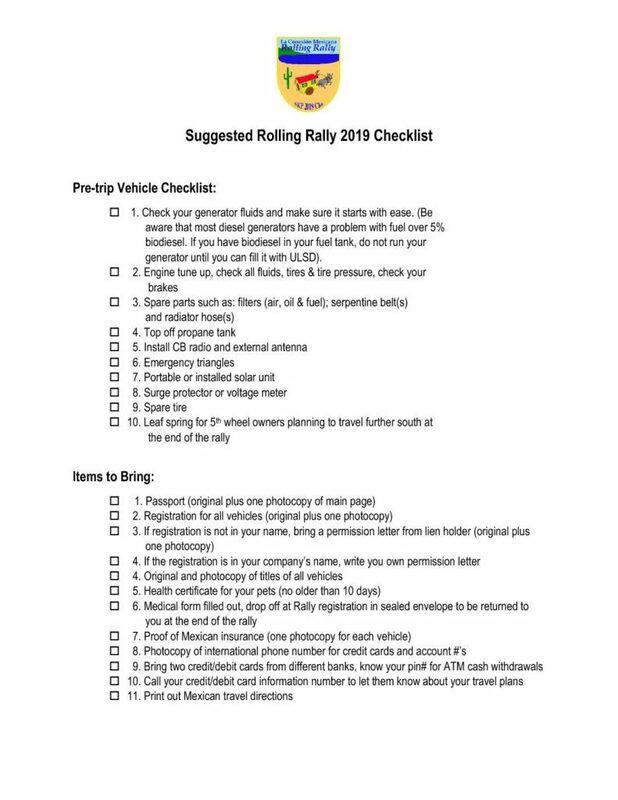 Please find attached the Checklist for our Rolling Rally. These items are not mandatory but meant as a helpful guideline. On another note, I understand that the news are still full about “terrorists” coming in from on south. All I can tell you that the small towns of Tecate USA and Tecate Mexico were very safe and peaceful and FUN 😊! Many RVer’s were crossing the border with us to spend the winter further south. We had a great time and made new friends, I am sure you will too! As I stated on a Facebook post earlier last week, absolutely nothing has changed at the Tecate border as far as we can tell except a bit more loops of razor wire on top of the same wall that was there last year. You will see some pictures from our late December Chapter 8 scouting trip in the upcoming newsletter next week. Despite what you may hear, I can reassure you that the Tecate border and the town were as tranquil as usual when we crossed over and back. 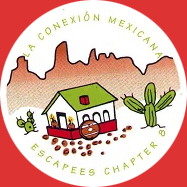 Please remember that our Facebook page, Escapees Mexican Connection, is a wonderful tool to stay in touch and share questions and information. I know some of you do not “do” Facebook and I was one of them until Chapter 8 talked me into it earlier this year. All I did was sign up with my name and a birth date (you technically don’t even have to use your real birth date I believe), I do not have a home page or anything about myself as I am still a bit uncomfortable about sharing my life publicly. Then I searched for Escapees Mexican Connection, pressed the ask to join button and was accepted immediately (that is nice 😉). I really enjoyed the interaction and find it a great tool for us all to stay connected. As many of you know, Ed and I are still working and January is a very busy month for us. I will do my best to answer all your last minute questions in a timely way, however do not be shy to also ask any of the seasoned Chapter 8 persons on our Facebook page as to general Mexico travel information. We are so excited to see you all at Potrero County Park on February 11th. I am sure we may see many of you at Quartzsite next week. Ed and I will be working int the Big Tent in Quartzsite. Stop by our booth for a quick hello and a SKP hug if you’d like!